Start your adventurous tour through South Africa and visit us in Mooilande, 50 km south of Johannesburg in the Midvaal area. Enjoy an African atmosphere in a rural area, approx. 50 min drive from O.R. Tambo airport. Stay a few days with us, relax at our rock pool, enjoy a drink or explore the nearby Suikerbos Rand nature reserve. Has a queen size bed and an en suite bathroom with shower and spa bath. For your convenience we offer coffee- and tea facilities, electric kettle and a fridge. DSTV is also available. This room is situated in the main house overlooking the pool on the 1st floor. has a double bed and an en suite shower. For your convenience we offer coffee- and tea facilities, electric kettle and a fridge. DSTV is also available. has two single beds, a sleeper couch in the loft ( which can be used as bed at extra costs) and an en suite shower. For your convenience we offer coffee- and tea facilities, electric kettle and a fridge. DSTV is also available. has a double bed and an en suite shower and Victorian bath. For your convenience we offer coffee- and tea facilities, electric kettle and a little fridge. DSTV is also available. has a double bed and an en suite shower. For your convenience we offer coffee- and tea facilities, electric kettle and a little fridge. DSTV is also available. 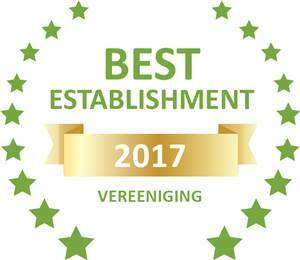 Based on reviews of establishments, Ikhamanzi B&B has been voted Best Establishment in Vereeniging for 2017. Based on reviews of establishments, Ikhamanzi B&B has been voted Best Establishment in Vereeniging for 2015. 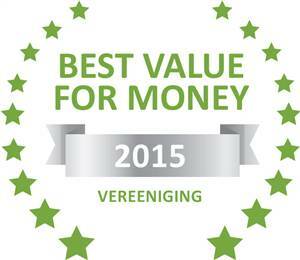 Based on reviews of establishments, Ikhamanzi B&B has been voted Best Value for Money in Vereeniging for 2015. The three thatched double rooms have their own patios and bathrooms, as well as TV’s, fridges, safes and coffee –and tea facilities. Please Leave us a comment on TripAdvisor using this button! Just wanted to send a quick note of thanks for your hospitality. We had a great time at Ikhamanzi Bed & Breakfast and the convenience of your cabin was the icing on the cake. Thanks again for all of your ... continued. I had an amazing Stay here!! wHAT I would do to go back only heaven knows!! Thank you for the pleasant time at your B&B Almut, I will be coming back very soon & wow the sceniry was amazing!! I'm proud to say i had a pleasant experience!